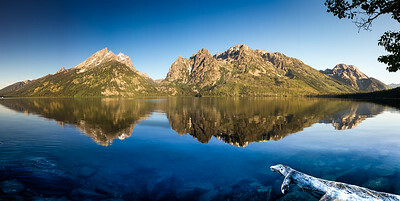 This is a panorama of Jenny Lake with the Grand Teton Range. It was another beautiful morning at the park. The sky was clear and blue and the water was still and blue. The only ripples in the water was caused by my foot sipping off the rocks into the lake. A panorama photo in the Grand Teton National Park with the Grand Teton mountain and a horse farm at sunrise. This is along the road within the park and of takes care of horses. The horses were out to pasture at sunrise and was able to capture a few out enjoying breakfast. The Teton range is sensational. This is a little further south than Mt Moran which i took a couple of years ago. The Grand Tetons at Grand Teton National Park at the Signal Mountain Lodge at Jackson Lake. The Grand Tetons are a wonderful site. 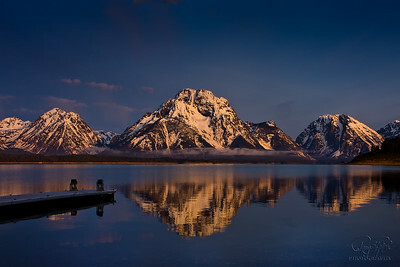 This is a shot of Mount Moran taken just after sunrise as the sunlight hits the teton range. It was at Lake Jackson to get the beautiful reflection . The Grand Tetons are a wonderful site. This is a shot of Grand Teton range taken just after sunrise as the sunlight hits the teton range. It was at Lake Jackson to get the beautiful reflection . At the boat ramp of Jackson Lake, a late spring sunrise with a taste of color and clouds made this a beautiful morning. The Sun Will Always Rise. This Photo of Mt Moran in the Grand Teton National Park was taken in June and was just before the sun starting to hit the top of the mountains. The clouds were coloful pink and the reflection in Jackson Lake was wonderful. You can see the photos changes as the sun came up. Beautiful Morning, Beautiful Morning. This is my first real attempt at a Panorama photo. It is the Grand Teton Range and Jackson Lake Boat Dock. It was taken in a beautiful morning on June 1. The sunrise was pretty, the lake was still and there developed some small clouds near the base of the mountain.